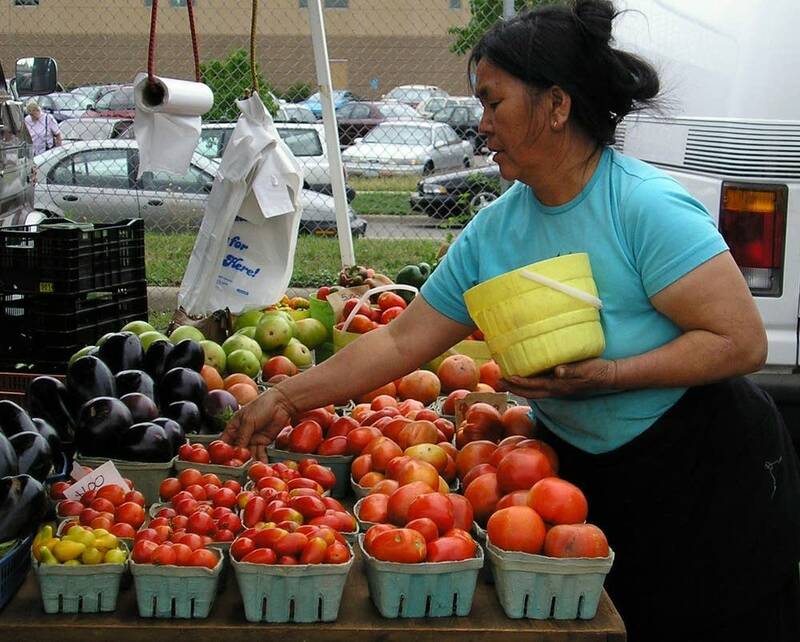 The Minneapolis school district has put a valuable piece of commercial real estate up for sale, but the district will only sell the land to developers willing to include a permanent home for a community farmers market. The area up for sale is at the center of a busy transportation corridor, where Lake Street and the Hiawatha Light rail meet. On a typical Saturday morning, you'll find lines of customers at most stands in the Midtown Farmers Market. Neighbors greet each other over displays of locally grown vegetables and stand talking with children on their hips. In one corner of the market people listen to live music and sip coffee. The Midtown Lake light-rail station -- the only elevated stop on the line -- stands stately over the scene, with its sleek colored glass catching the summer sun. Eric Gustafson is the assistant director of the Corcoran Neighborhood Organization. He said the Midtown Market has helped define this neighborhood for the last seven years. "Which market is more connected that this? It's accessible to mixed income neighborhoods," Gustafson said. "This isn't Lake of the Isles or downtown. It's the Powderhorn community; it's a diverse neighborhood." The Minneapolis School District allows the neighborhood to use the six-and-half acre site for free twice a week. The market started out simple and small on the weedy lawn and parking lot surrounding a three-story gray building that was once a school. 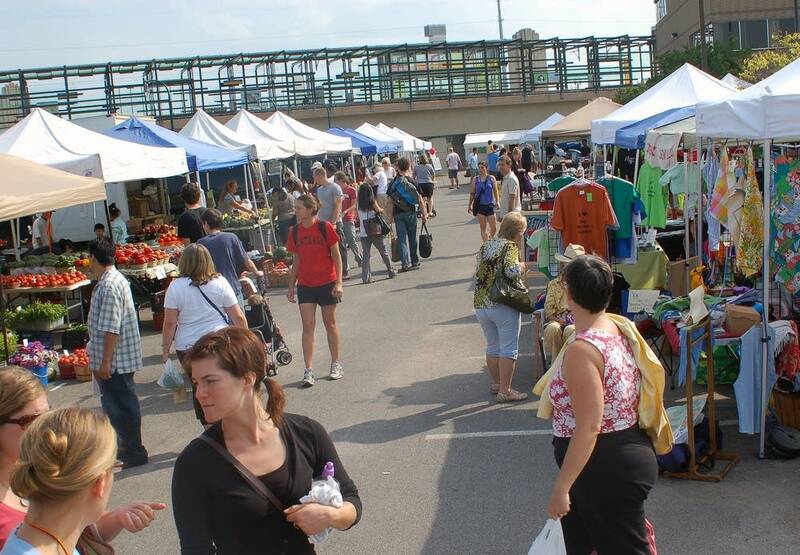 Last year, it was named among the top four farmers markets in the country. "There's a new generation of farmers markets and local food movement," said resident Gerry Tyrell, one of many who organize the market. "I think we're creating public spaces for those community spots now that haven't existed and are important to the community." When school district officials decided to sell most of the Lake Street property, Tyrell said Corcoran residents were worried. They spent months applying consistent but polite pressure on local officials. Jessica Ward-Denison, a resident, said they took every opportunity to remind politicians that they didn't want the market to move. "Every time you see them, whoever it is it's 'so senator, so councilmen, any updates you can give me?'" Ward-Denison said. Earlier this month, when the school district released its request for proposals, it was clear the lobbying had been successful. The district asked developers to come up with plans that included permanent space for the market. Mark Bollinger, the district's facilities director, expects developers to offer a fair price despite the unusual stipulation. "The school district does have a need for funds, that's our job to make sure we protect the school district, but at the same time if we can help the community and help develop pieces in the city, that's what we're after," Bollinger said. The Minneapolis department of community planning and economic development is handling a bid process for the district. Department director Mike Christenson said the Lake Street property is one of the best transit-oriented development sites in the metro area. He said it looks like there may be a happy ending for all parties involved, and that's rare. "That's not at all normal and it just speaks so highly to what the Corcoran neighborhood has done and the organizers of the Midtown Market have done," Christenson said. School district officials expect to hear back from developers by November and the final decision rests with the school board.